if robin hood rode a bicycle it surely would be this one. it has a certain singular attitude to it (no pun intended). 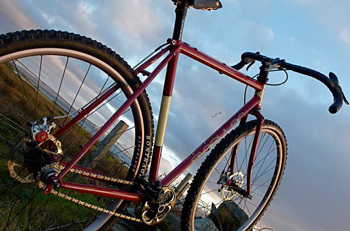 one speed, more than just knobbly cross tyres and a set up reminiscent of original off-road bikes by such builders as overburys and saracen. it certainly has attracted a lot of attention. folks in the village have actually stopped me to ask questions, so much so, that i have been considering going out on it under cover of darkness! why have a look at a machine such as this? why does it attract so much attention? after all it is just a bike - however with non skinny tyres but moustache drop bars it certainly looks different. it has a classic spray job with cream panels on deep red. it rides differently too. surprise surprise. it is comfy, with a brooks b17 as a bum park and sticky cinelli tape on the retro bars. on-road it is like the tourers of the 60s and 70s with a long wheelbase, solid action and fair response time if one stamps down on the pedals. it's armchair like and i would guess that riding in traffic would be a doddle - i tried it past a tractor today and the local keeper's landrover slowed to have a look too! 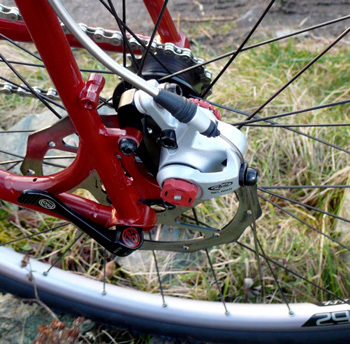 stopping with the two avid mechanical disc brakes is marvellous and setting them up was pimps. they even have micro adjusters to get it just right. the drivechain is cleverly controlled by the old fashioned but reliable eccentric bottom bracket - if you happen to ride tandem then you'll know how easy this is to adjust. it also means that chain tension is not reliant on the twist of a nut on a dropout. for a roadie, the chainset seems unfeasibly small: at 34 teeth it is! matched to a rear of 17 it gives a gear of 52.8 inches which is the equivalent of a 42x21. which gives a ratio of 2:1 and to be really anorakish, it means a gain ratio of 4.06 and development of 4.210 metres or 165.7 inches. (phew)with a rear gear hanger it can happily accommodate gears. the dropout spacing is correct for a standard block/cassette too. - very versatile. it is a machine that transcends the need for a mountainbike/ tourer/ hack/ ridetowork/ gooutandmuckaboutwiththekids. it is more than capable of all these. beware though, it is not a full blown atb - but with 29er wheels and tyres it is easy to use offroad - and unless you are going to do anything really silly then it will suffice. i took it up the track past rag aridh and on to bolsay where - a wee field/hill/rocks/burn - jumped out to bite us. i also dashed around with some wee people quarter my age and we had fun. clearances are good even with a 1.8 tyre - (i did try lighter ones but had problems with the wide rims and seating a 700c tyre correctly). i would like to have a shot at a cross race with it. no - it would not be sven nys's choice - but it would be quite acceptable on the local club scene. i approve of naming machines and models rather than by numbers and even more so as singular has decided to call this after one of the fastest flying predators in the world - a bit of a misnomer maybe- however with its grace off road and ability to swoop along lanes with little effort it does like watching a peregrine fly (what - you've never done so?) it brings a smile to one's face. much to the disapproval of bp i fitted a saddlebag (far too ctc) and filled it up with 12kg of weight and headed off - not a wobble or inconvenience - it was solid. reliable. it will happily manage mudguards/fenders and can take racks - front and rear - so if you need tour without your c50 and following car then it is possible with the peregrine. transcending road and mountain this machine is worth a try and as we are all at the moment full on with training then, if i could keep it, i would be out pushing the boundaries and trying a wee bit of casual cross with a smile on my face. and ride to work on the monday too.